RE: Rojo says he might start a Kip Litton thread but only 1 and only 1 thread 1/8/2011 12:40AM - in reply to Great news folks! It's funny, there are no photos of him anywhere in that race, not even hiding behind somebody else in their photo. There was a group of guys that finish just seconds before Kip supposedly did, yet in their photos right before they cross the line, he is nowhere to be seen. I would go as far as to say that Kip never ran in the 8k, he just paid for it, and then got just close enough to the start and finish mats to set the chip off. 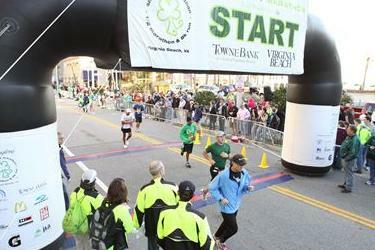 Just look at the map http://www.shamrockmarathon.co...%20Map.pdf the start and finish are right next to one another. This race, as I understand it, was the day before the Shamrock half marathon, where he ran a 2:53 marathon, but he changed outfits. as for the outfit change, let me know what you think. maybe they were breakaway windsuit pants like the kind commonly worn in the 1990s? The idea of an accomplice handoff midway is compelling. But it still doesn't explain why bother with the delayed start and also how the accomplice can run so fast through hordes of huge fanny packers. Something still doesn't add up. On the other hand, this is the only possible explanation for a point to point course like boston. Why does Maki have photos along a road path and another road but I don't see any for that other guy? RE: Rojo says he might start a Kip Litton thread but only 1 and only 1 thread 1/8/2011 6:13AM - in reply to Great news folks! So when is rojo going to start the thread??? Well, which ones are legit for sure? Apparently he ran 2:54 in St Louis a week before 2:52 in Boston 2010. That is bloody impressive. 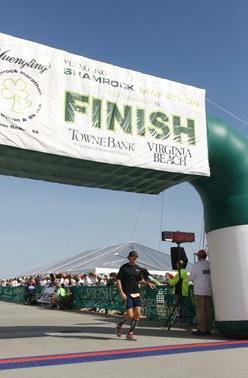 There is picture of him walking across the finish in Shamrock 8k, doesn't look like he even ran the race. I can't copy and paste it. But go to the photo page from this link to photo 289-??? He's in there wearing his usual black garb. Well he rarely,if ever, runs an even pace from the results I've seen. Usually one or the other half is run near his (supposed) half PR pace. This is a phenomenal site. I'm sure it's been discussed on the other threads, but he was caught and DQd at the Delaware Marathon. People that cheat in races like this are sociopaths. Every so often a new one pops up. One thing that I've noticed is that they tend to be doctors, for reasons I cannot explain. There was one discussed on Letsrun a few years ago, I think he was in his upper 60's. Then, there was an infamous doctor and professor in the DC area that got DQd at 2 marathons for course cutting. I met him once and knew that something was seriously wrong with the guy. He could not stop talking about himself, both his running accomplishments and jumping out of airplanes in Rwanda while getting shot at. Yes, there is a photo of him past the line, yet in the photos of the guys that he finished next to, there are no photos of him right before the line. You would think that there would be something in the photos of the guys that crossed just seconds ahead of him. Yes, I am looking at photos by clock time. Kip had a clock time of 35:15. The guys that I am referring to had clock times of; 35:08, 35:11, 35:13, and 35:14. First came the "Stop Pre" t-shirts. It looks like the "Stop Kip" t-shirts may be next. He's a dentist. Always knew i couldnt trust dentist. No, those look like regular running pants, which even with a zipper at the bottom can sometimes be hard to take off over running shoes. And one doesn't just toss away nice running clothes like this, so where did they go? Mostly, however, no serious sub 3-hour marathoner is going to stop by remove their clothes and start running again. It looks like he wants to appear as 'Joe-slow' at the beginning so there is less suspicion if he fades off the course, and then wants to appear more as a serious runner when he reappears back on the course. Also note that in none of the finish line pictures which have been linked does he even looks like he has broken a sweat or pushed himself across the line to get a fast time. Factor in this - both the short distance races he has run on here BAA 5km (17:17) and Shamrock 8km (29:40) he started at the back of crowded races, so factoring in navigating around people those times would have been somewhat faster if he had started on the 2nd row.